Deep Water Cay, The Bahamas | Tailwaters Fly Fishing Co. Numerous commercial airlines service Freeport daily from multiple hubs on the east coast including Ft. Lauderdale and Miami. Many bonefish destinations in the Bahamas require connections in Nassau or cost prohibitive charter flights. Not so with Grand Bahama. From Freeport, guests are transferred approximately forty-five minutes to the east end of the island for a two-minute ferry to Deep Water Cay. There is also an airstrip and customs service available at Deep Water Cay for those flying on private aircraft. Like most Bahamian destinations, bonefish fishing is the main event for flats anglers at Deep Water Cay, however the east end of Grand Bahama also has a legitimate permit fishery as well as frequent opportunities for tarpon. The area is loaded with large barracuda and sharks as well as loads of other species ranging from mutton snapper to jack crevalle. Multigenerational guides operate Hell’s Bay skiffs to access the skinniest of flats, and Deep Water also runs an offshore program for bluewater species such as dorado, wahoo, grouper, tuna, and more. Is Deep Water Cay Right For You? 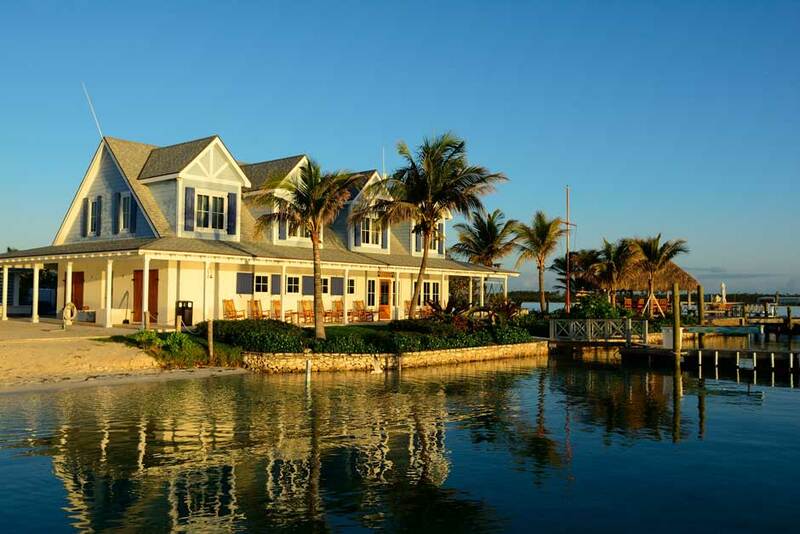 Deep Water Cay is the perfect place for folks looking for upscale accommodations, quiet atmosphere, and all the creature comforts of a 5-star facility combined with a truly world class fishery. It is a perfect venue for an intimate couples trip or family holiday as well as groups of flats fishing fanatics who want to do it in style. 6 Night / 5 Day Fishing Package is $4863 per person from mid-November through February and $5187 from March through mid-July and October through mid-November (based on shared room/boat). Additional expenses include but are not limited to airfare to Freeport (FPO), alcoholic beverages, gratuities, and guided non-angling activities. Shorter and longer packages are available, as are private rooms and boats, upgraded accommodations, and packages for non-anglers (See RATES for more detail). 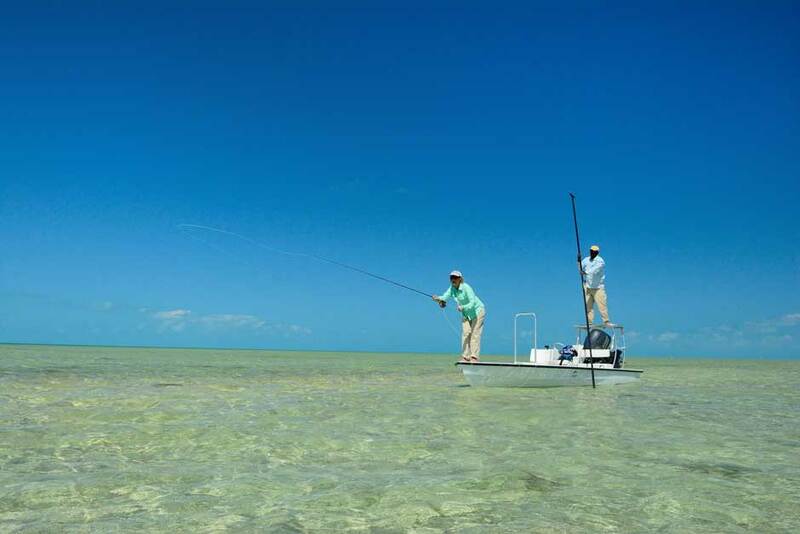 Fly fishing for bonefish was invented at Deep Water Cay, and the fishing program, guide team, and accommodations have been continually improved and fine tuned for the last sixty years. As a result of this long and rich history, Deep Water Cay Club combines world class bonefish fishing with an old-school – yet upscale – Bahamian fishing club. Deep Water Cay is a 2.2-mile private island at the far east end of Grand Bahama. It is easy to reach, only forty-five minutes from the commercial airport in Freeport that receives daily direct flights from several major U.S. hubs such as Miami (as well as a private airstrip on Deep Water Cay itself). Gil Drake and Field & Stream editor A.J. McLean founded Deep Water Cay Club in 1958. It is hard to imagine a nicer fishing lodge. Think “bonefish lodge meets country club” – and we mean that in the best, least pretentious way. DWC has incredible food, beautiful accommodations, modern amenities, pleasant staff, superb non-angling activities, and a very tangible and charming vibe from 60 years of rich history. The 250 square miles of pristine flats surrounding DWC are home not only to ridiculous numbers of bonefish, but some of the biggest and least pressured bonefish in the Bahamas. DWC belongs on a very short list of places where anglers have a legitimate shot at landing a double-digit bone. It also offers reasonably frequent opportunities for permit, tarpon, sharks, cudas, and more. The multi-generational experienced guide staff running top of the line Hell’s Bay skiffs do an excellent job of setting up anglers of all skill levels for maximum success and enjoyment. The incredible fishing and unmatched accommodations, along with its history, truly make Deep Water Cay Club a destination suited to everyone from the hardened saltwater angler to couples and families. Deep Water Cay has it all. 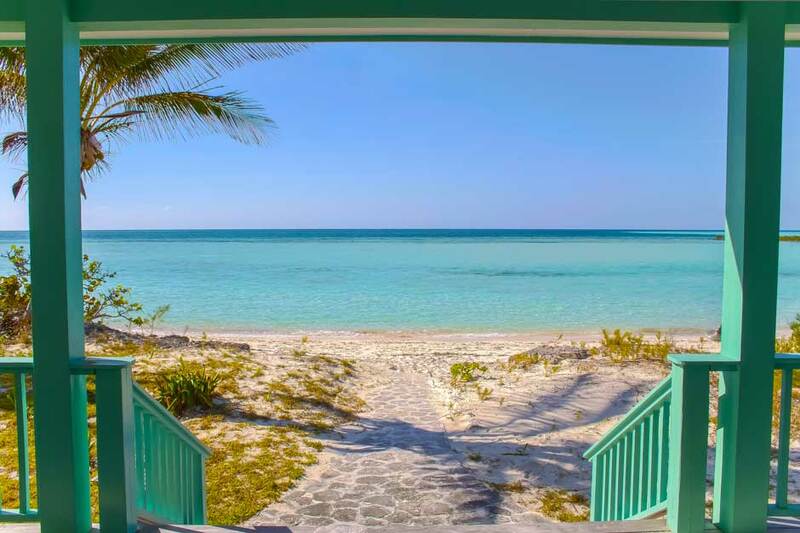 Deep Water Cay is located on the far east end of Grand Bahama Island – approximately forty-five minutes from the commercial airport in Freeport (not to be confused with the high powered megaresorts in Nassau on New Providence Island). Situated on a 2.2-mile private island, Deep Water Cay Club combines the charming history of an old-school Bahamian fishing club with the modern amenities of an upscale boutique resort. Founded in 1958 by Gil Drake and Field and Stream editor, A.J. McLean, it is hard to imagine a nicer bonefishing lodge. 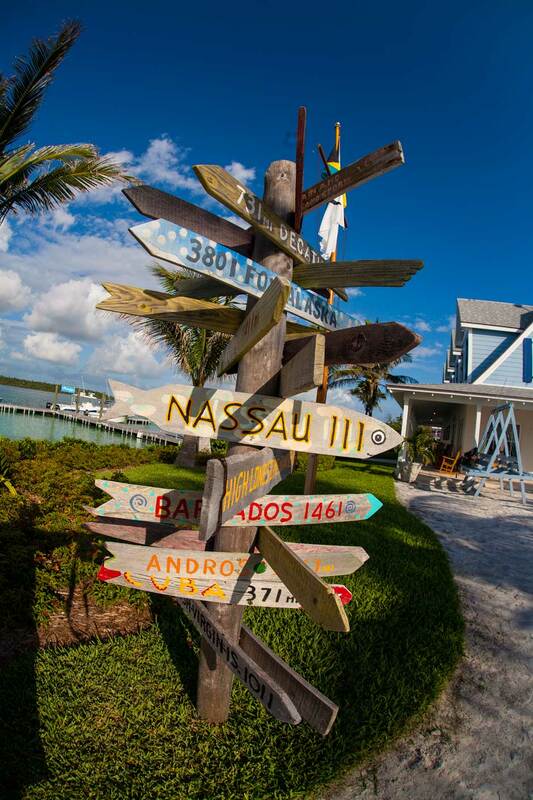 The best way to describe Deep Water Cay is to imagine “bonefish lodge meets country club.” Sound over the top? It’s actually just right, and they really do pull it off in an unpretentious way. DWC has incredible food, beautiful accommodations, pleasant staff, and a very tangible and charming vibe from 60 years of rich history. It is also a venue for the hardened saltwater angler as well as the couples or family holiday. A multi-generational experienced guide staff runs top of the line Hell’s Bay skiffs targeting some of the biggest and least pressured bonefish in the Bahamas, as well as reasonably frequent opportunities for permit, tarpon, sharks, cudas, and more. With tastefully refurbished guest cottages or private home rental options, gorgeous clubhouse and infinity pool, stunning beaches, easy access with commercial air service, private airstrip on island, legit non-angling programs, tip top equipment, and 250 square miles of pristine surrounding flats – Deep Water Cay is the grandaddy of bonefish destinations. Deep Water Cay is one of many smaller islands that make up the far eastern end of Grand Bahama. This fragmented archipelago creates a labyrinth of creeks, channels and cuts connecting the north, south, and eastern coasts of Grand Bahama. As a result, anglers are never more than a few minutes from finding the best tidal scenario and favorable conditions. This unique geography also limits long boat runs and ensures that fresh flats are always around the corner. Grand Bahama has a well-deserved reputation for having some of the largest bonefish in the Bahamas. While some flats have legions of the garden-variety 3-5 pounders, some of the more ocean-side flats offer frequent shots at fish upwards of 8 pounds – and double-digit bonefish are not uncommon. While some interior flats have a soft bottom (most often out of the wind) and others have turtle grass, there is a surprising amount of skinny, hard, white sand flats that provide excellent wading opportunity as well – a nice perk not always available at big bonefish fisheries around the Bahamas. It is hard for your jaw not to drop when you first arrive and see the fleet of a dozen brand new Hell’s Bay Professional and Marquesa skiffs tethered at DWC’s private marina. Not a cent is spared outfitting any aspect of the island’s operations or equipment. Their shallow drafting, top of the line skiffs with 4-stroke Yamahas and all the electronics and creature comforts are no exception. You will also be very impressed with the quality of the guides as well. Generational Bahamian guide names like Pinder, Rolle, Thomas, Cooper, and Glinton still push anglers around the flats, and uphold nearly sixty years of the highest guide standards at DWC. While bonefish are the primary target species, the east end of Grand Bahama offers the closest thing to a legit permit fishery as you will find in the Bahamas. The broad, open expanse of ocean separating Grand Bahama from the Abacos provides incredible habitat for exceptionally large permit. 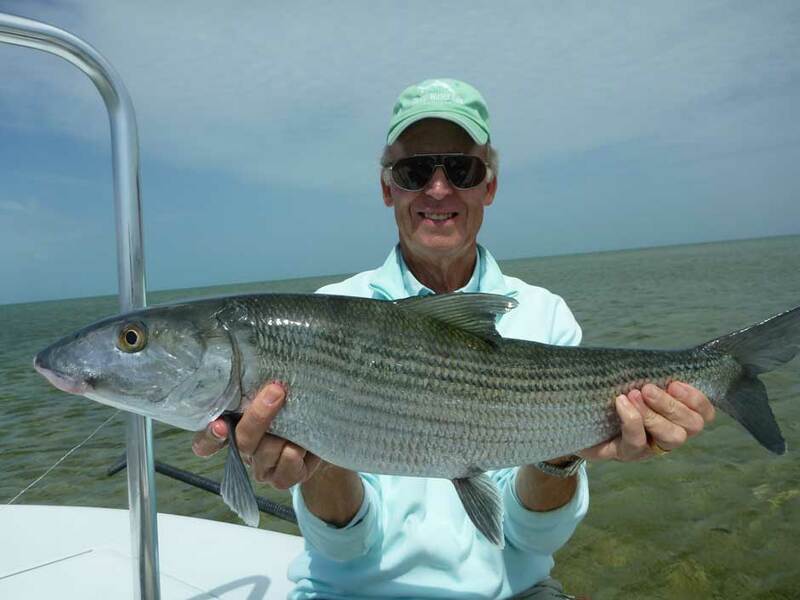 It is a niche part of the Deep Water Cay program and is a long run from the standard bonefish areas, but making a run east or southeast of the lodge can pay huge dividends. 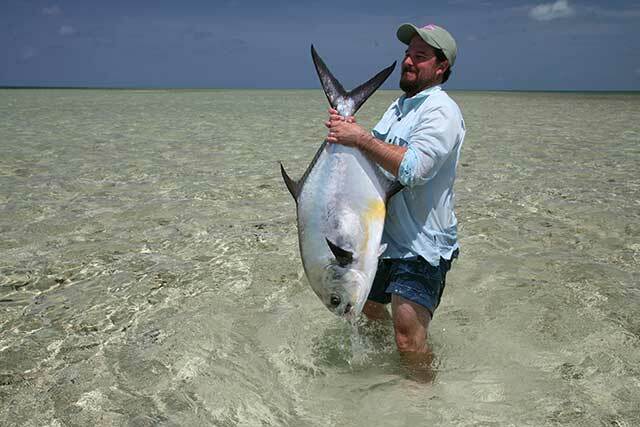 The permit fishery is actually very small and tightly managed; so don’t expect to fish it every day. Yet with a lot of luck and the right conditions, it is a unique aspect of the DWC experience we certainty recommend exploring when possible. For more variety and an extra bend in your rod, huge barracudas and sharks seem to be around every corner, and several species of snapper are prevalent. Having a 10-weight rigged for tarpon is also a must. For a change of pace from the flats, guests have the option of going out beyond the reef on a 28 foot Grady White for a myriad of snappers, groupers, barracudas, and more. Bluewater fishing is also a possibility with some advanced notice, and the nearby mahi-mahi, sailfish, and wahoo fishery can be fantastic. Still haven’t had enough fishing? The windward flat right in front of your cottage is a killer “home flat” to get warmed up or finish the day casting to tailing fish with a sunset cocktail. Deep Water Cay has a well stocked “shop” with a broad selection of flies and tackle, clothing, sunglasses, sunscreen, and anything else you might have forgotten. 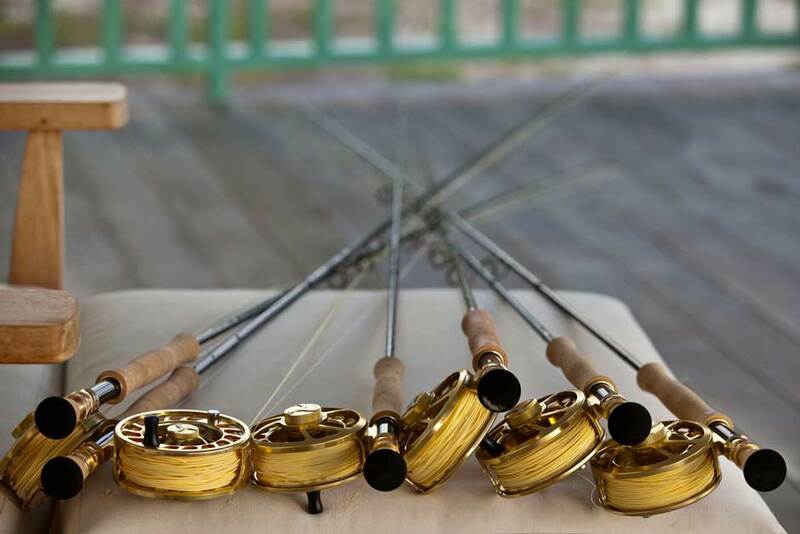 Top of the line rental outfits with Sage rods, Tibor reels, and Rio lines are available if you don’t want to bring your own or have a gap in the arsenal you need to fill. 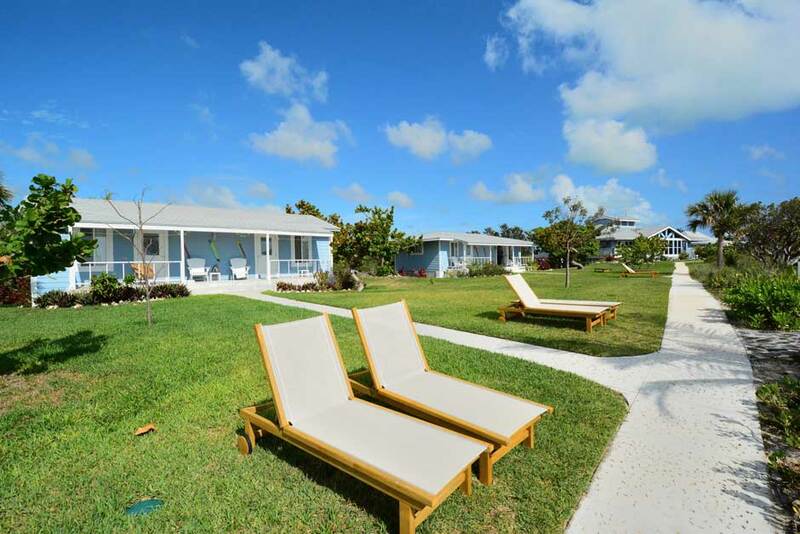 Most fishing guests stay in one of Deep Water Cay Club’s seven double occupancy cottages located adjacent to the main clubhouse and the fishing center. These recently refurbished houses have two queen beds, walk-in closet, refrigerator, coffee maker and super cold air conditioning. Each cottage has a wrap-around porch with a view of the beach, ocean, sunrise, and inviting bonefish flat right out your front door. Larger groups or families should consider a private rental house with up to 4 bedrooms. The beachfront rental houses are located a few minutes up the island by golf cart from the main clubhouse and offer additional living spaces, spectacular privacy, and stunning views of the secluded beach. The “welcome center” and gift / fly shop at Deep Water Cay is located by the docks and has a legit selection of clothing, flies, gift items, sunscreen, and anything else you may have forgotten. It is also the place where you organize your rental fishing or diving gear. 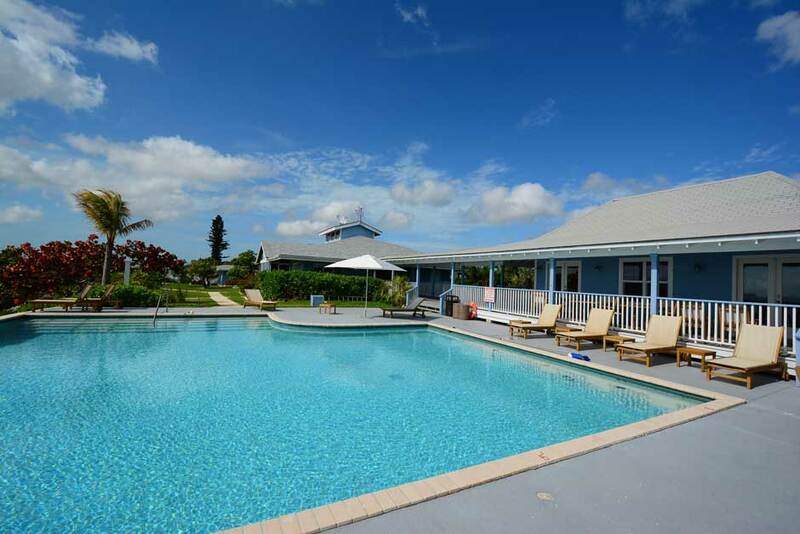 The clubhouse is the main social gathering area for guests at Deep Water Cay Club. The bar is well appointed with every conceivable spirit and is a cozy, lively spot to enjoy happy hour. Walls of the clubhouse are covered with several decades of photos from past guests with their trophy catches – including the likes of Lefty Kreh, Ted Williams, Joe Brooks, Flip Pallot, and many more. Words cannot describe the quality of the service, dining and wine either! Adjacent to the main clubhouse is a fully appointed game room with billiards, a huge flat screen, TV and wrap around porch. There is a completely outfitted gym downstairs with all types of exercise machines including elliptical, treadmills, and stair climbers. The centerpiece of the club house is the large infinity pool that overlooks the ocean with an incredible view – the perfect place for non-angling sun worshipers or a cooling freshwater swim following a day on the flats. The clubhouse is equipped with high speed wireless internet and guest computers are available. Cell phone service is also available, but all guests should check with their cellular provider about international rate plans. 20 anglers (10 boats maximum) & additional accommodation for non-anglers. Several major airlines serve Freeport, Grand Bahama on a daily basis including American, United, Delta, Bahamasair, and JetBlue. These flights originate from Miami, Fort Lauderdale, and Atlanta. After clearing customs in Freeport, guests are collected at the airport and driven approximately forty-five minutes on comfortable black top highway to the east end of the island. A two-minute boat ride then delivers you right to the dock at Deep Water Cay. A 4500′ private airstrip and Bahamian customs service is also available on Deep Water Cay for those flying on private or chartered aircraft. Depart on a flight connecting through Miami, Fort Lauderdale, or Atlanta to Freeport, Grand Bahama. Once through customs, guests are collected by a representative from DWC and transferred eastward approximately forty-five minutes. From McLean’s Town, guests take a 2-minute ferry over to Deep Water Cay. 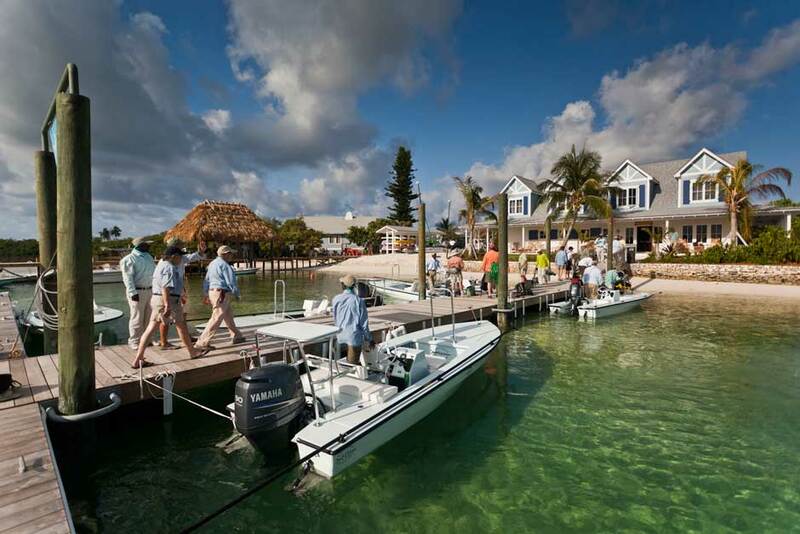 After breakfast in the main clubhouse, anglers meet their guides at the docks by the welcome center at approximately 7:30-8:00AM and depart for a full day on the water. Lunch is taken on the water (unless you prefer to return to the clubhouse for lunch) and anglers are usually back to the dock by 4:30PM in time for a dip in the pool, shower, and sunset cocktails. Dinner is served around 7:00-7:30PM. Depending on their flight schedule, guests typically check out mid morning and are transferred approximately forty-five minutes back to the airport in Freeport for departing commercial flight. Cool weather and windier conditions can be a factor. The fish are of course always there, but you run the risk of getting cooler weather from the States. However, it is equally as possible to have 80-degree days and little wind. 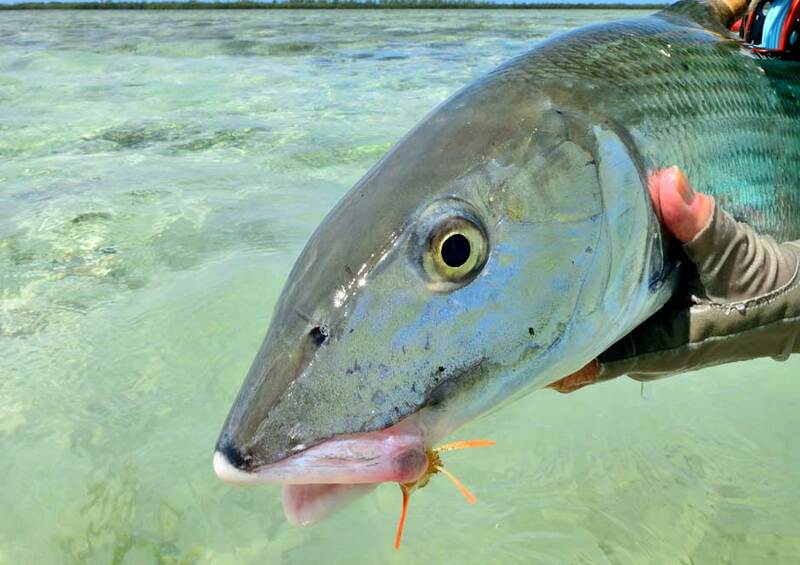 Some of the best bonefish fishing follows the passing of a cold front when water on the flats warms up, inviting rested bones back on to feed. This is a great time for trophy bonefish. The prime spring months to fish the Bahamas. Consistently warm (not too hot) weather dominates the forecast, with steady but not unpleasant winds. The fish are there, however hotter conditions and little breeze often exist. If you don’t mind the heat, the fishing can be excellent and is a good time for beginners to learn because of the lack of wind. Lodge is closed for peak hurricane season and maintenance. The best time to fish in the fall. Conditions are very similar to March – April type conditions. Deep Water Cay should definitely be considered a destination for folks with non-fishing companions in tow. The service, amenities, and abundance of organized and casual activities are enough to keep the most restless guests entertained. 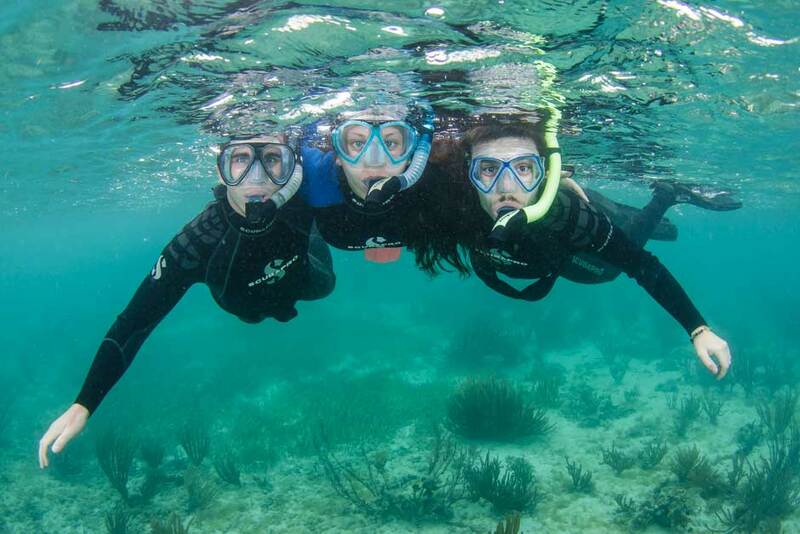 Activities such as diving, snorkeling, paddleboarding, sailing, and kayaking are all available, and DWC maintains top-notch equipment and gear for all water sports. The club maintains both a 33-foot World Cat catamaran and brand new Nautica dive boats to explore the area’s abundance of world-class blue hole and shallow water dive sites. All dive equipment is on site and dive instruction can be provided at Deep Water Cay. A tennis court, bicycles, and a legit gym with numerous workout machines are also available for folks wanting some exercise. Of course, hanging out in the infinity pool and simply kicking it on the beach is not all bad either! Licensed massage therapists and spa treatments are available upon request. NOTE: Shorter and longer packages, private beachfront residence upgrades, and packages for non-anglers are available. Please inquire for details. Airfare to Freeport, Grand Bahama (FPO); Tips for fishing guides ($80/day); Offshore Fishing; Alcoholic beverages; Equipment rentals; Flies & terminal tackle; Deep Water Cay Landing Fees (when applicable); Transportation to and from the Freeport Airport; Additional Non-Angling Activities; VAT and Resort Taxes; Massage Service & Gift Shop Purchases; Items of personal nature. 50% deposit required with reservation. All deposits or final payments are non-refundable. No booking is considered confirmed until receipt of deposit. Final payment must be paid 90 or more days prior to arrival date. Any bookings requested within 90 days of reservation date must be paid in full. Schedule changes made 90 days or more prior to reservation date are without penalty. Schedule changes made 89 days or less prior to reservation date are charged a $250 per room penalty; Schedule changes cannot made less than 15 days to arrival date and no credit may be applied to future trips. Refunds of deposits/payments made on credit cards will be charged a 3.5% service charge to fully compensate Tailwaters Travel for all bank charges incurred. Refunds or credits cannot be issued for fishing time lost due to inclement weather. Receipt of deposit and/or final payment is acknowledgement that registrant has read and accepts the cancellation, refund and responsibility clauses.